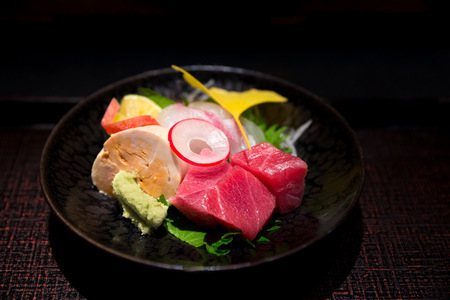 Saba makes a fatty, oily, and decadent piece of sushi, extremely rich in flavor. 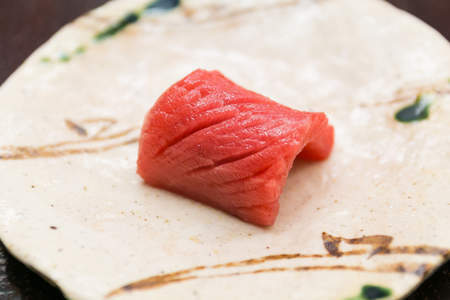 Though its use in sushi is very widespread, saba sushi has roots in Edomae (19th century Tokyo-style) sushi. The common preparation of shime-saba (cured and marinated in vinegar) was a staple technique of the time. The mackerel family has a number of varietals from Spanish mackerel to the common Norwegian mackerel to Japanese ma-saba, or “true mackerel.” These fish are spread out all over the world and migrate from north to south, ensuring their availability all year round. 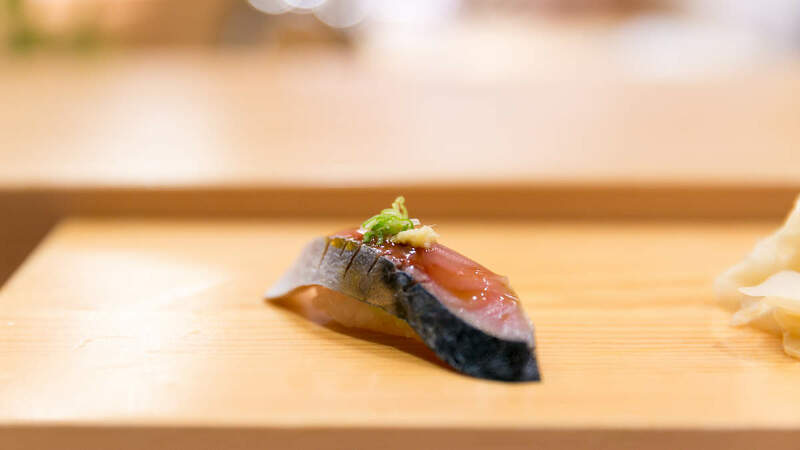 Saba’s flavor is incredibly complex so many will simply describe it as “flavorful” or “strong.” It has a bit of fishiness (not too much when fresh), saltiness, some notes of sourness from both the natural flavor of the fish and vinegar marinade, and deep umami. When at its freshest and fattiest, it can even be quite sweet. Mackerel is a migratory fish with some stocks migrating up and down coasts to spawn and others even migrating across oceans to find waters suitable for feeding. So the season depends on the region in which the fish were caught. In today’s global economy, you can enjoy saba in any season of the year. 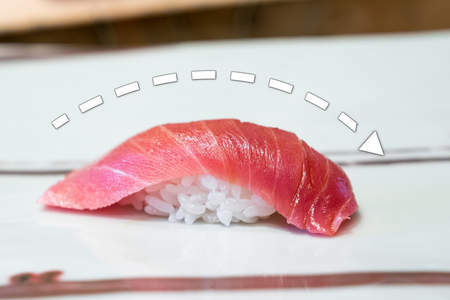 Although fish has a reputation for spoiling quickly, saba is one of the worst, so it is important that only the freshest saba be used in sushi. Even a day or two after being caught, the flesh begins to degrade and fall apart. In part because of its short shelf life after death, a very common preparation is one which helps preserve texture and enhance flavor: shime saba. In this technique, the sushi chef must heavily salt the fillets of saba before marinating in rice vinegar. It is a widespread myth that the salt and vinegar techniques used in shime-saba kill any parasites the fish may have. This is simply not true. Research into the topic tells us that these methods make little, if any, impact on parasites. Parasites are quite common in saba (as high as 98% infection rate in one study), so it is important that you only source fish for sushi from suppliers who took measures to destroy them by freezing. 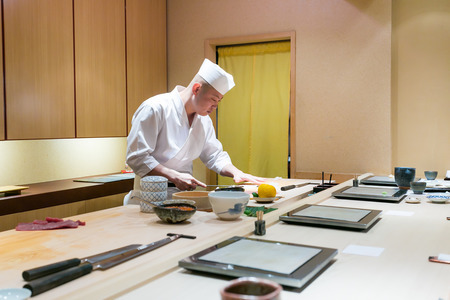 To prepare shime-saba, fillet the fish as usual and remove any pin bones. Turn the fillets over so the skin side is down. Rub a healthy dose of salt all over the flesh side so that the fillets are fully covered. Leave the fish to cure like this for an hour to 90 minutes before gently rinsing off all of the salt with fresh water. The flesh should feel a bit firmer as a result of the salt drawing out excess moisture. Prepare a mixture of diluted vinegar of 80% high quality rice vinegar and 20% fresh water. 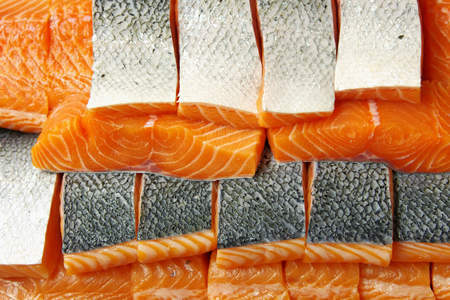 For smaller fillets, let the fish marinate for 20 minutes; for larger fillets, let it marinate for 40 minutes. When you remove the fillets from the vinegar, briefly rinse them with fresh water and pat them dry. There is a thin layer of skin which must be removed before eating, but can be very tricky to do. Try to separate the layers of skin at the edge and peel it off like a sticker. You should be left with a small amount of shiny skin and can now slice the fish for sushi and sashimi.